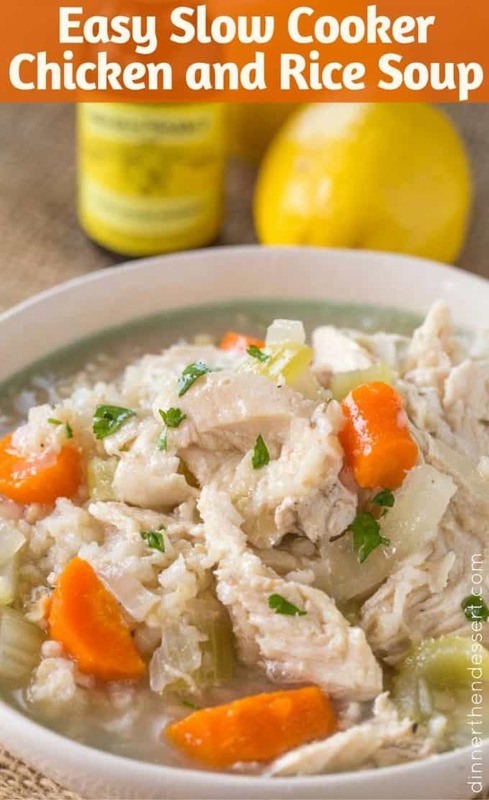 Slow Cooker Chicken and Rice Soup with brown rice and chicken breasts, this soup is comforting and warm with no extra added fat and with the use of lemon extract it can be made from pantry ingredients any time of year. 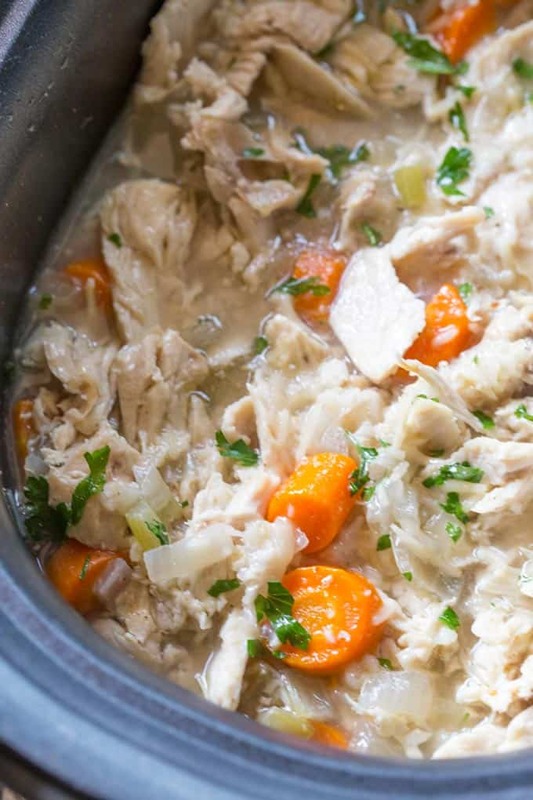 Slow Cooker Chicken and Rice Soup can be made in just minutes and in addition to the amazing soup you’ll get to enjoy for dinner you’ll come home to a kitchen that smells like your mom has been cooking for you all day. This post has been graciously sponsored by Nielsen-Massey Vanillas who sent me a delightful box of extracts and vanillas just like last year when I made this Flourless Mocha Cake with Creme Anglaise. I’ve been a fan of theirs and a loyal customer for almost a decade so to work with them a second year in a row is pretty exciting. One of my favorite things about this soup is that there isn’t any added fats. 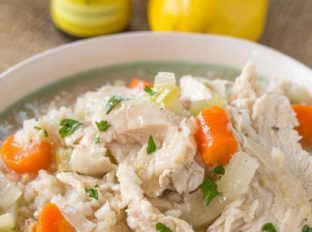 With white meat and brown rice this soup is as healthy as you could want while still being filling. The brown rice is soft and fluffy and because you’re not using white rice it helps keep you fuller longer. 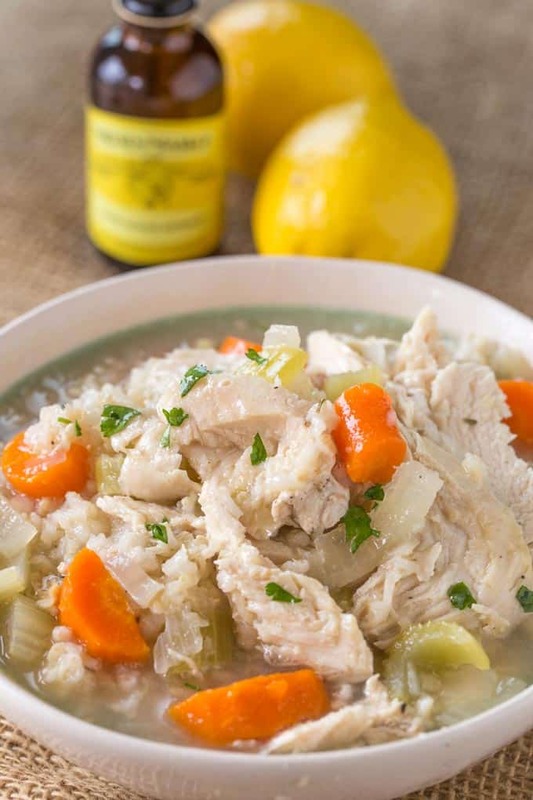 With the addition of Nielsen-Massey Pure Lemon extract instead of running out to the store for lemons you can make this soup any time of the year with just a few ingredients you likely already have in the fridge. The lemon extract, like their other extracts and vanilla add tons of flavor without additional calories, salt or fat. Plus, the kitchen smells absolutely delightful with the addition of the lemon! Use skinless chicken thighs (bone in if you can) for a silkier, heartier flavor from the fat in the chicken and the marrow from the bones. Change the herbs, we are not fans of rosemary, but chicken and rosemary are a great combination, so if you have favorite flavors you can of course change it up. We love tarragon and lemon together so this was a perfect combination for us. 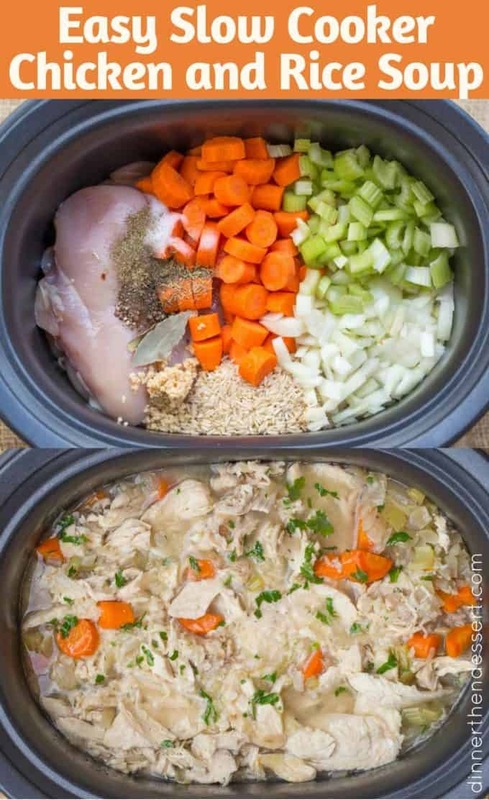 You can add butter to the slow cooker to add to the richness of the soup if you’re using white meat. You can mix in greek yogurt when you’ve served up a bowl to make this a creamy soup (this is my favorite). 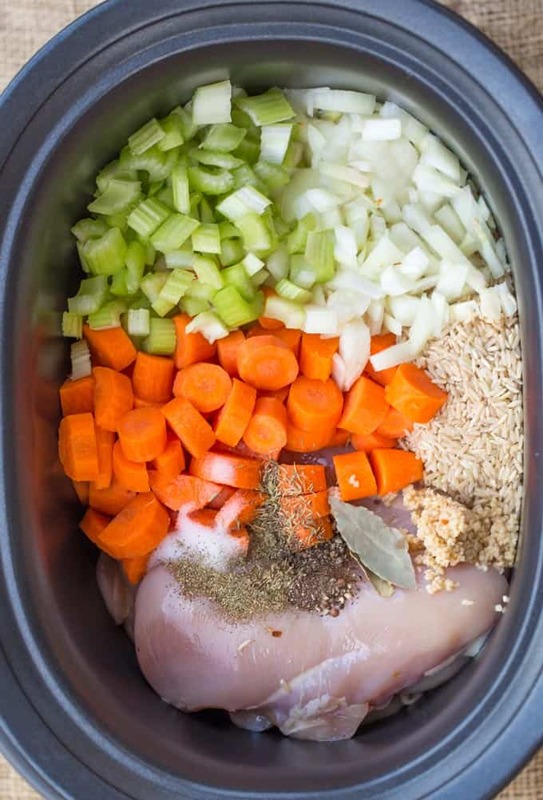 Looking for more recipes like this Slow Cooker Chicken and Rice Soup? Slow Cooker Ham and Potato Soup <– This one has over 1 million views and 400,000 pins on Pinterest! Lemon Extract – From my favorite source for extracts, I love their vanilla extract, powders and paste too! 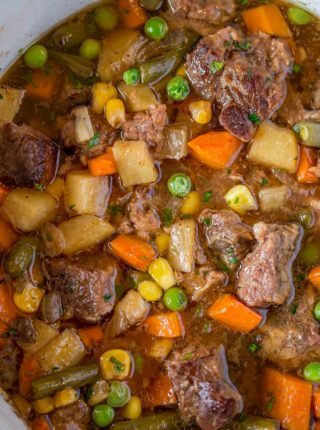 Put all the ingredients into the slow cooker and cook on low for 4 hours. 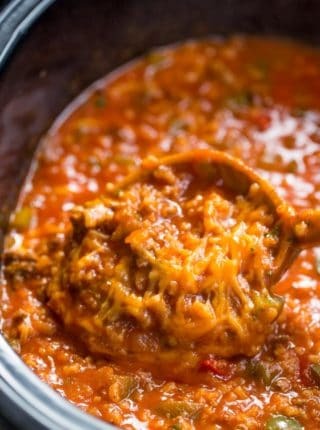 If your slow cooker is on the hotter side for most recipes, cook for 3 hours to avoid mushy rice or add the rice after an hour of cooking. With a fork and knife shred/cut the chicken into bite sized pieces and put back in the soup. See in the post for additional serving options or flavor ideas. This post was generously sponsored by Nielsen-Massey. All opinions are my own. 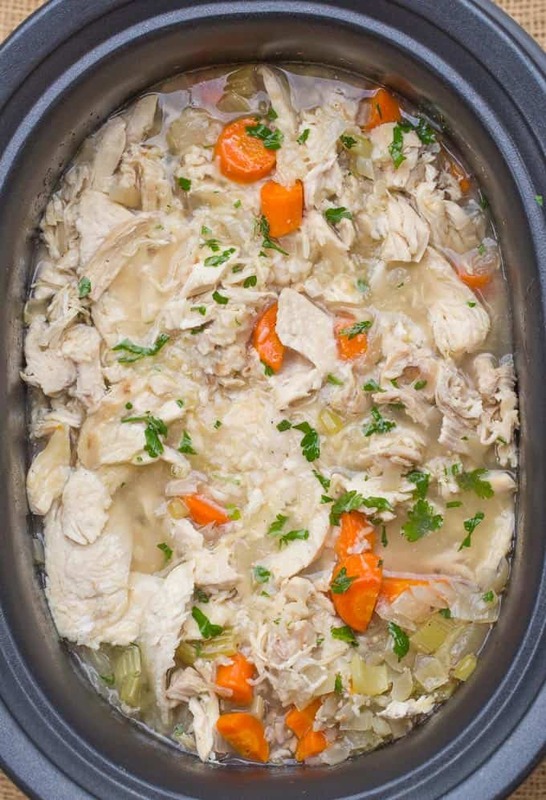 I made this this using leftover chicken and it was so good I love a good soup recipe especially when I can make it in the crock pot, so easy! The only thing I would change when I make it next time is to put a little less rice, once the rice cooked up it really seemed like a lot which I figured it probably would but when I make a recipe the first time I always like to follow the recipe to see if I like it. Really delicious and easy thanks for sharing! Remarkably tasty! Easily the best chicken soup I’ve ever made. I used a small rotisserie chicken from my local grocery store, Minute Rice brown rice, Penzey’s spices (for onion & garlic, too), 3tsp plain lemon juice, and an even mix of chicken and vegan beef flavor bouillon (clearing out some leftovers). So glad you enjoyed it Grace! I made this soup last night with boneless thighs and everyone in my house loved it!!! I also used Far East long grain and wild rice and only put it in after following the directions on the box , making it ahead of time and adding it about a half hour before serving…. awesome!!!! So glad you enjoyed it, Kathi! hi! Should I change the cook time for frozen breasts? Thanks! You really want to make sure that your chicken is fully thawed before putting it into the slow cooker otherwise the chicken will produce too much liquid while cooking. I even pat my thawed chicken at times with paper towels to get even more of the liquid off of them. I can’t find the lemon extract. Can I use lemon juice from a fresh lemon? You could substitute the lemon extract with 2 teaspoons of lemon zest. Enjoy! Set it and forget it…which I love. Gorgeous soup. 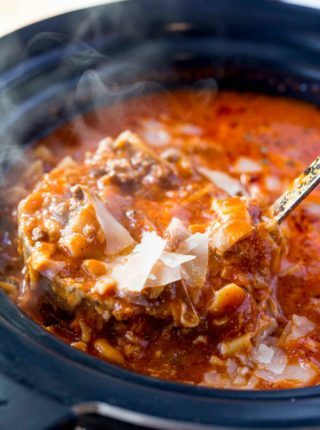 Anything I can make in my slow cooker is exactly what I want! 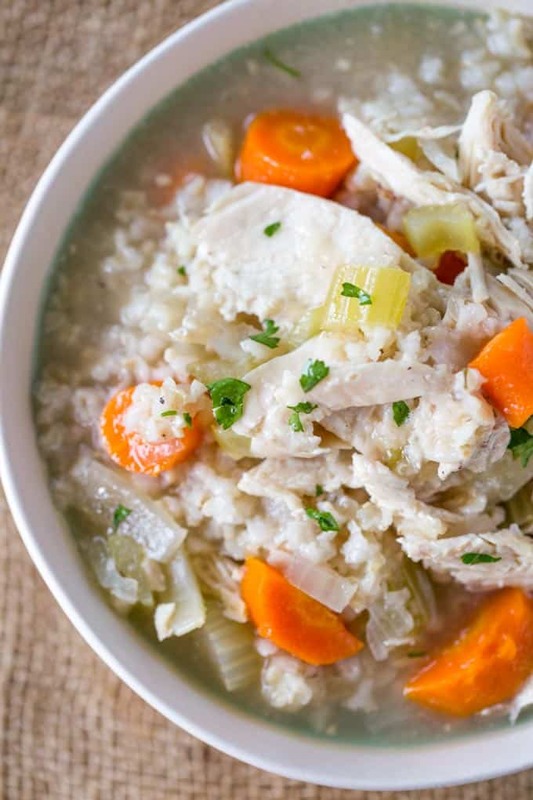 Plus, chicken & rice soup is one of our faves! This is my kind of soup! Can’t wait to try it! What a great idea to use lemon extract in a soup! This looks like the perfect bowl of comfort food. 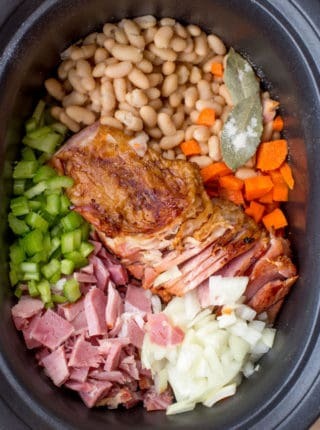 Love that it is thrown in the slow cooker. This soup sounds delicious! I want a big bowl for dinner!